You won’t find better crafted wines than those produced by Nicolas Thienpont and his team. There is wonderful purity, texture and harmony amongst the wines here in 2016. I thought 2015 was great but I came away with an equivalent degree of excitement this year. I’ll write in more detail about the wines in a later post but Château Pavie Macquin itself was wonderfully powerful and there was exceptional purity in Château Beauséjour HdL. This is a wine that is clearly skirting with perfection. Château Larcis Ducasse is brilliant and Château Berliquet continues its exciting redevelopment from excellent [and replanted] terroir sandwiched between Canon and Angélus. The wines the Thienpont’s produced in the Cotes de Bordeaux were impressive. Château Alcée in Castillon is up there amongst the best properties in that appellation, as is Château La Prade in Francs. Château Puygueraud should prove good value. The white looked good, as did Les Charmes Godard. 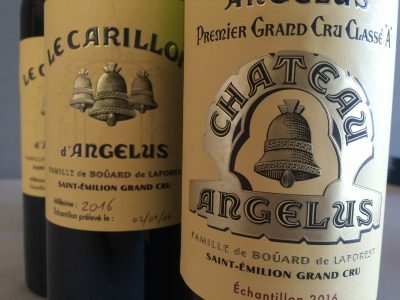 Just over the other side of St Emilion, Château Angélus has produced a profound beauty in 2016. It has wonderful depth. Carillon is excellent. I was particularly struck by a gorgeous Château Daugay and a violent-scented Château Roc Boisseaux in St Emilion. 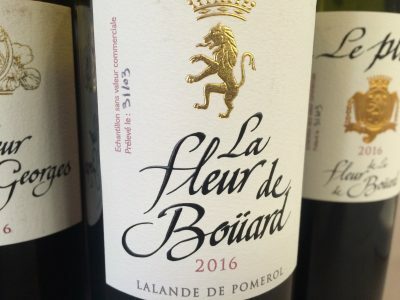 The Lalande de Pomerol, La Fleur de Boüard always impresses. It is one of the most seductive wines of that interesting appellation. It does not disappoint in 2016. Le Plus de La Fleur de Boüard has profound levels of depth and extract. For drinkability I’d opt for the regular bottling. In his capacity as consultant with the Midas touch Hubert de Boüard de Laforest not only advises a number of properties on the right bank but has also made a serious foray into the left bank. This is perhaps most notably with the CA Grand Crus group [where he consults for Château Grand Puy Ducasse, Château Meyney and Château Blaignan], but also I see he now has a hand in Château Arnauld, Château Bernadotte, Château Lanessan, Château Charmail and Château Lamothe-Bergeron amongst others. These all looked impressive in 2016. Paulliac Grand Puy Ducasse is knock-out. Amongst his right bank clients I’d tasted a lot of his St Emilions at the Grand Cercle event. There Clos La Madeleine, Château Laroze and Château de Pressac looked very good. In Pomerol Château La Pointe also really struck me. Is this the best La Pointe yet? Finally I moved on to the Grand Cercle event to work my way through the three dozen or so wines [all tasted blind]. 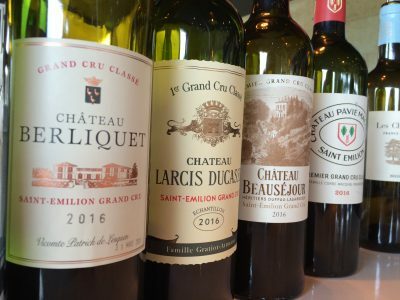 The first dozen were from the St Emilion Grand Cru Classé appellation. 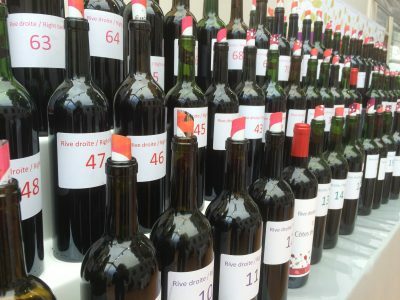 The second two dozen wines from the left bank appellations, mainly the Médoc and Haut-Médoc but also Margaux, Pauillac and St Julien. I was greatly impressed with all the St Emilion Grand Cru Classes tasted. Those that really stood out were Château La Marzelle [yet again], Château Bellefont-Belcier, Château Destieux, Château Yon-Figeac, Château Fombrauge, Château Fonplégade, Clos La Madeleine and Château Sansonnet. Unfortunately Chateau Barde-Haut and Chateau Ripeau didn’t show at the event, despite being members of the Grand Cercle. Amongst those represented on the left bank at the Grand Cercle tasting, I was very impressed with several Médocs, including Château Greysac, Château Patache d’Aux, Château Ramafort and Château La Cardonne. In the Haut-Médoc appellation Château Malescasse was excellent, alongside Château d’Arcins, Château du Cartillon and Château d’Agassac. In Margaux Château d’Arsac has nice elegance and Château La Tour de Bessan looked good. In Pauillac Château Fonbadet looked exciting and Château Bellegrave was good. In St Julien Château du Glana impressed. Overall in the Médoc and Haut-Médoc I was struck by the attractive quality of the fruit, the balance in the wine and the ripe tannins in 2016. I caught up with Gavin Quinney in the afternoon at the tasting. He’s very pleased with his own wine at Château Bauduc. He was impressed by the quality and the homogeneity of the vintage across Bordeaux in 2016. I’d agree. By the end of day two the vintage was shaping up nicely for me. There are lovely aromas and textures in Bordeaux 2016. There is plenty of depth of fruit in the wines and real succulence to the tannins generally. There is good freshness and the alcohols in proportion. On the right bank too, over-extraction felt less apparent. That’s not to say there weren’t some chewy numbers but partly due to the nature of the tannins in the vintage, I didn’t find over-extraction the issue I remember it being in the early stages of judging 2009 or 2010.